Since WWE confirmed in January 2019 that Dean Ambrose will leave the company in April, the Shield member has lost several matches against the likes of EC3, Elias and Drew McIntyre on Raw, while he was not even involved on the card at WrestleMania 35. Following last Sunday’s event, the former WWE champion was written out of storylines when he was launched through the announce desk by Bobby Lashley on Raw. He then returned after the show, alongside Roman Reigns and Seth Rollins, to bid farewell to the crowd in Brooklyn, New York in an off-the-air segment. It appeared as though Ambrose had said his final goodbye to the WWE Universe after he made his post-Raw speech. However, eagle-eyed fans have spotted that he is still being advertised on WWE’s website to appear at the next three Raw events. With that in mind, let’s take a look at four theories why “The Lunatic Fringe” is included in Raw advertisements despite the fact that he appears to be on his way out of WWE. #4 Will the ads change after the Superstar Shake-Up? The April 15-16 episodes of Raw and SmackDown Live will feature the 2019 Superstar Shake-Up. Very few reports have emerged about who could move where in this year’s roster changes, so the two shows should provide plenty of surprises for the WWE Universe. 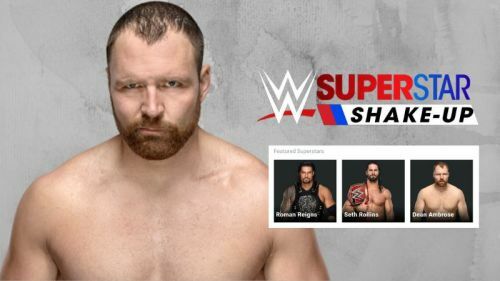 Looking at the Raw events that Dean Ambrose is advertised for over the next few weeks, the ‘Featured Superstars’ list also includes Roman Reigns, Seth Rollins, Braun Strowman, Drew McIntyre, Baron Corbin, Bobby Lashley, Finn Balor and Sasha Banks. However, if past Shake-Ups are anything to go by, we usually see Raw Superstars surprisingly turn up on SmackDown Live the day after Raw and they do not necessarily appear on the red brand the previous night. That means that many of those names above are likely to miss Raw, despite being advertised for the show, and that WWE will almost certainly alter their advertisements for future Raw and SmackDown Live shows once the Superstar Shake-Up is over. Perhaps Ambrose is just another name on that long list that will be removed following the upcoming roster changes.